Fireworks must have been expected at this year’s Barrick Gold annual meeting of shareholders on April 24. Inside and out, police and security lined the Metro Toronto Convention Centre. Many more shareholders came out for this important annual meeting than ever before – so many, in fact, that some were left outside. “Bad times bring out more people,” quipped Peter Munk, the octogenarian company founder who arrived in his signature fedora. But while there were no full-on pyrotechnics, the annual check-in was far from business as usual. It’s been bad times indeed for the 30-year-old Canadian gold company, which has seen its share price drop almost 50% since the beginning of this year. And now its crown jewel, the Pascua Lama mine on the border of Chile and Argentina, has had its budget rise from $3 to $8.5 billion and faces more delays on its start date, pushed to early 2014 from mid-2013 thanks to a court injunction for possible environmental violations. The meeting begins with Barrick CEO Jamie Sokalsky’s opening statement. 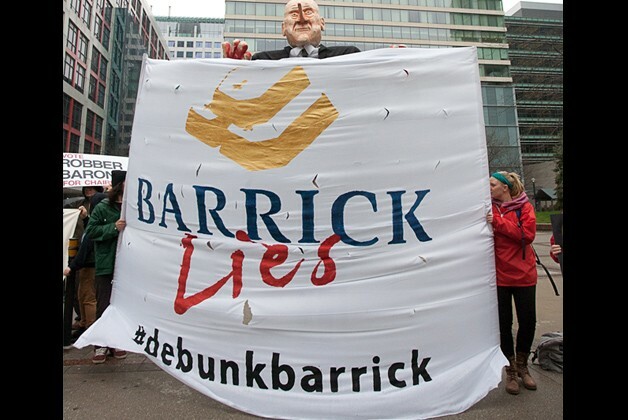 “It’s been a tough year and a challenging year for Barrick. We faced some significant challenges, some out of our control, some within our control,” he says with masterful understatement. Seated in the front row are the board of directions, a who’s who of international movers and shakers, from former PM Brian Mulroney to Venezuelan media mogul Gustavo Cisneros and economist and anti-foreign-aid theorist Dambisa Moyo, who does not look impressed. But, alas, despite acknowledged errors and obvious investor worries, there is no major shareholder rebellion here, and the board’s slate of officers is voted in unanimously. The only overt conflict occurs over a $17 million payoff, including a signing bonus of $11.9 mil, to Barrick co-chair John Thornton. Pension fund reps and other investors are so vexed by it that they defeat a resolution outlining Munk’s method for rewarding executives. One Quebec shareholder, Philippe Bélanger from the RRSE (Regroupement pour la Responsabilité Sociale des Entreprises), tells NOW he’s stunned by Munk’s self-criticism. “This was the first time I have ever heard a chair say, ‘We made a mistake to begin this project,’” he says. Bélanger has been tracking the Pascua Lama project and made several recommendations in both 2005 and 08 for an independent study on the risks to the water and the glaciers. “What we said back then at the AGM about the risks has now materialized,” he says.